Growing up the ever popular rice krispie bun adorned the table at almost every kids birthday celebration and we all loved them. Calling this sweet treat “buns” may sound a little odd, as the dictionary version of a bun is… “a bread roll of various shapes and flavouring, typically sweetened and often containing dried fruit”. But in Ireland, they were called, “Rice Krispie Buns”… and I’m sticking to the name. There is also the two ingredient version (also called rice krispie buns), made with melted chocolate and rice krispies, but we like the chewy crunchy texture made with mars bars and marshmallows. Made theses on countless occasions, they never fail to please and we’re not just talking about kids here… adults love them too. While I was making these my grown-up kids came into the kitchen, each commented “ooh yummy, your making rice krispie buns, when can we have one”? I have made plenty to so there was no waiting around until photographs were taken. 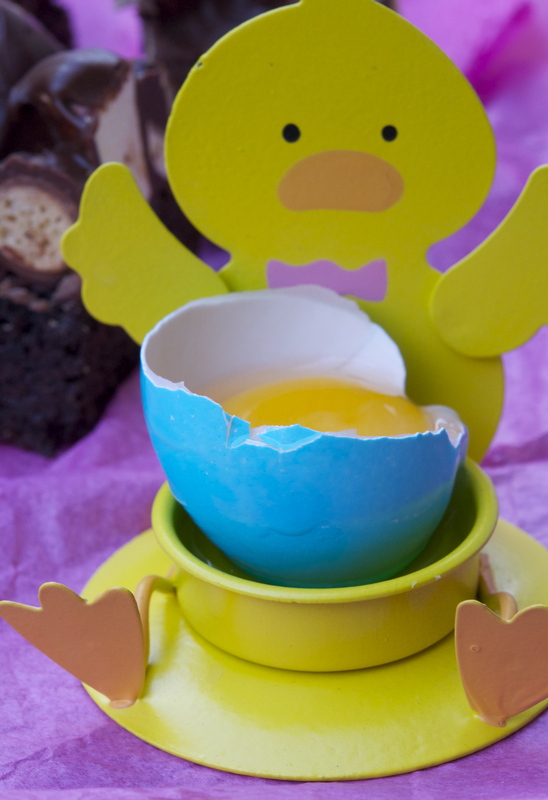 As this is a no-bake recipe they are quick and easy to make and perfect for Easter, birthday parties and other celebrations. Decorate the rice krispie buns with sugarpaste blossoms and butterflies for a springtime theme or use colorful sweets and sprinkles. Of course you don’t have to decorate them, they are just as good left plain and I think the best way to enjoy them is straight from the fridge. Now I am off to make myself and hubby a coffee… guess what sweet treat we’re having on the side? Before you start have the cupcake cases and decorations (if using) in place. Next, place the butter and mars bar into a medium heavy-based saucepan. Over low heat, melt the ingredients together while stirring continually until the mixture is smooth. Add the marshmallows, keep stirring until softened and beginning to melt. Remove the mixture from the heat and stir in the rice krispies. 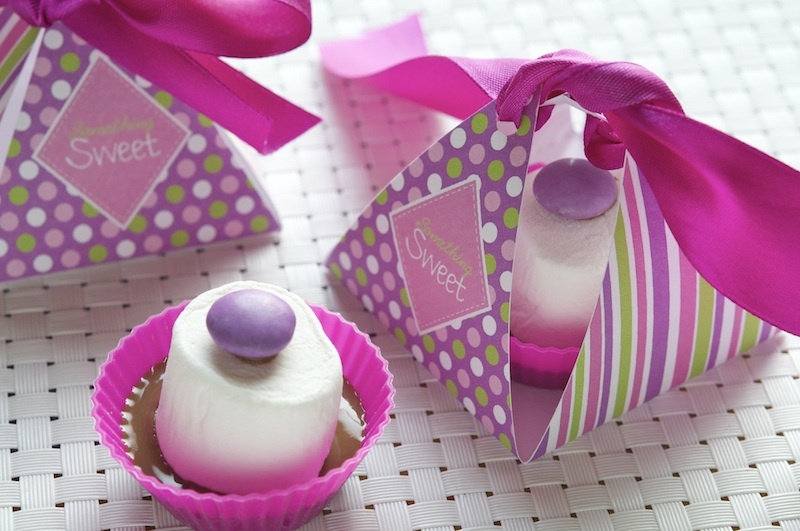 With the help of two dessert spoons, spoon the mixture into the cupcake cases. If you plan on adding decorations do so while they are still sticky. Place the rice krispies buns on a tray and chill in the refrigerator (uncovered) until set, for about 20 minutes or until needed. For longer storage keep refrigerated in a suitable storage container with a lid. Note: You do not have to wait until the marshmallows are completely melted, once they are soft enough mixing in the rice krispies breaks them up. Gergaoun falls on the 14th night of Ramadan and when my children were small they loved to celebrate the occasion! Dressed in their traditional clothes (jalabiya and thobe), they would excitedly head out to their Grandfathers home during the evening… with their empty Gergaoun bags clutched tightly in-hand. Together with their cousins, the children would visit the many houses around the neighborhood, receiving gifts of nuts and sweets which filled their empty Gergaoun bags. When all the houses had been visited, the children would return to their Grandfathers home proudly displaying overflowing Gergaoun bags and bursting to tell a few stories on some naughty older cousins that would partake in a dare called ding-dong-dash… leaving the younger children red-faced to do all the explaining! Older children would also parade around the neighborhood, entertaining children and adults with the popular mascot “Frasya” the horse-man, while beating drums and singing traditional songs. As there was always quite a gathering of children and adults I usually contributed by making lots of little goodies for the occasion, cupcakes, small cakes, rice krispie buns, cookies and Marshmallow Top Hats! These sweet treats were always well received and my customary trays of goodies became a yearly tradition until… the children grew-up! 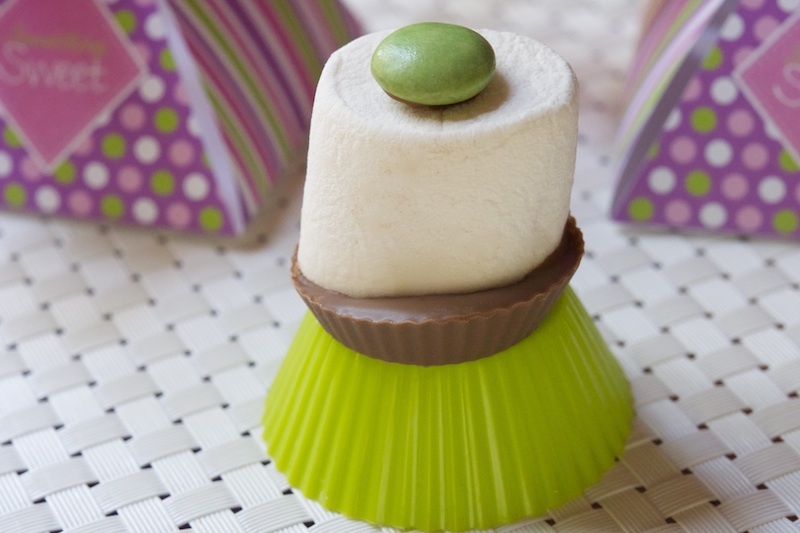 Marshmallow Top Hats are an old childhood sweet treat that my mother would make for our birthday parties, the squishy marshmallow with its chocolate chunk base and Smartie on top, always went down a treat! Making them for my own children’s parties and celebrations always proved popular. However, I did notice that some things never change... there is always that one kid who would make an attempt to pick all the colourful sweets from the top of the marshmallows… usually having their attempts thwarted by some of the other party goers! 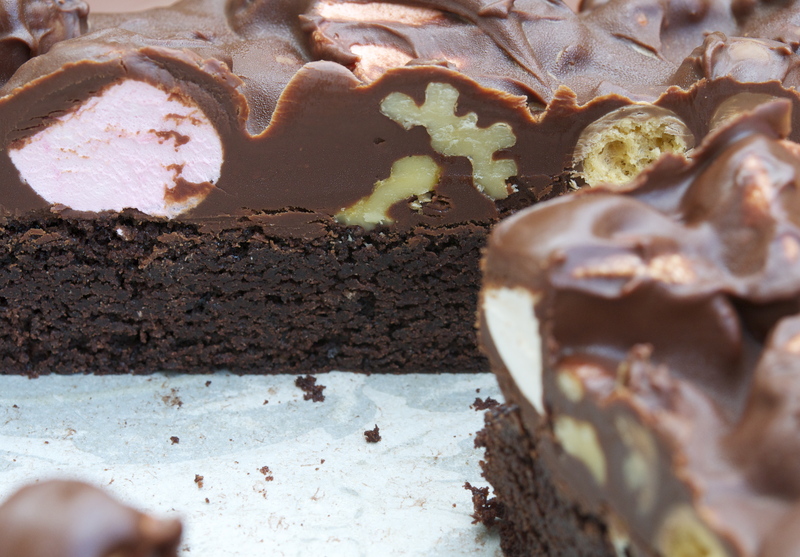 The recipe is super easy to make and young children will eagerly help with placing the marshmallows into the melted chocolate and sticking the colourful Smarties on top… usually avoiding the brown coloured ones! 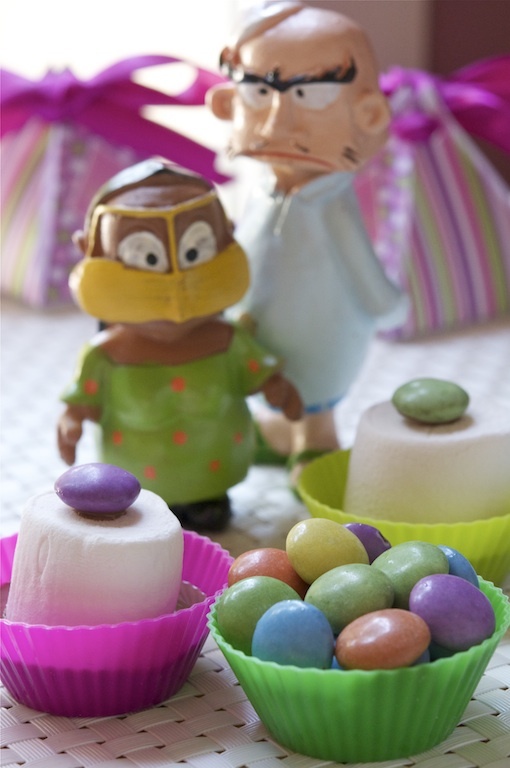 When packed individually into pretty little colourful gift boxes for Gergaoun or other celebrations, these Marshmallow Top Hats make a delightful sweet treat for children! How to make: Place a teaspoon of melted chocolate into each paper case ( however many you are using) and place a marshmallow on top, gently pushing the marshmallow down into the chocolate. 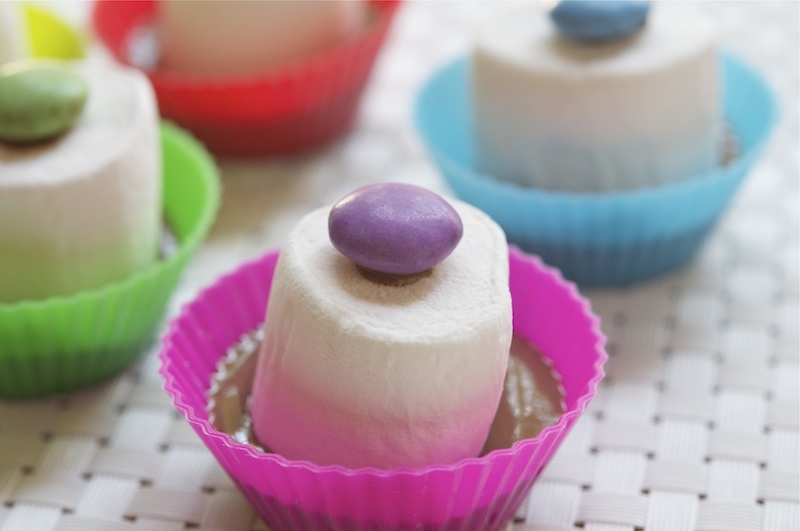 Place a small dot of melted chocolate on the top of each marshmallow, then place a colourful sweet on top. Store in the fridge (covered) or in a cool place until the chocolate has set before serving. Enjoy your kids when they are small… they quickly grow-up! Have you got any Marshmallow memories? Looking at the Good Food Calendar hanging in my kitchen I could not help but take notice of the very rich and delectable looking Rocky Road Chocolate Cake featured for the month of April… it was like as if the photograph was saying…“bake me”, “bake me”… so I did exactly that! It has been quite some time since I made anything rocky road and with my son back for the holidays, home baked goodies were back on the menu. I quite liked the idea of a chocolate cake topped with a layer of rocky road which consisted of melted chocolate, marshmallows, walnuts, raisins and crunchy Maltesers… definitely a rustic and homely looking bake! 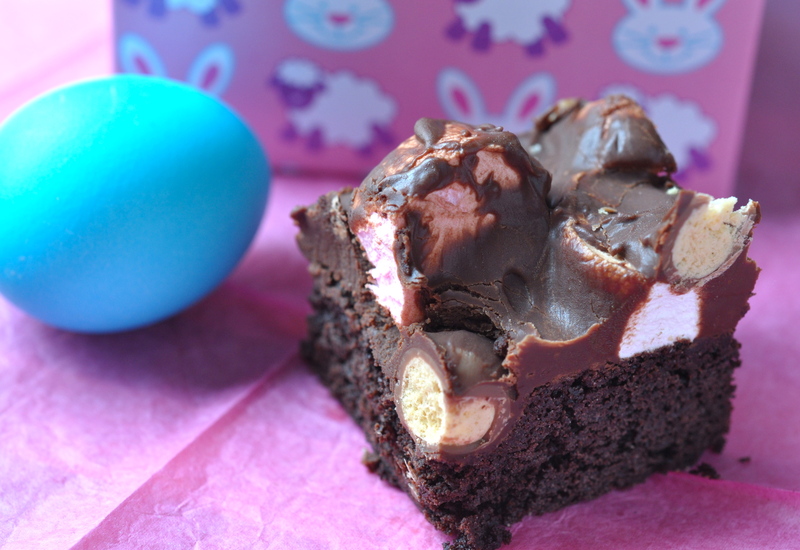 Place some Rocky Road Chocolate Cakes into little gift boxes and give to family and friends for a special Easter treat. Note: Looking at the recipe I decided to add in 1 teaspoon of vanilla extract when mixing the ingredients for the chocolate cake base. Rubbing a little vegetable oil on the scissors, helps prevent the marshmallows from sticking. I omitted the raisins from the rocky road layer. Chilling the finished cake makes cutting into squares much easier. You will need a 20cm square cake tin greased and lined (side and base) with baking parchment. How to make: Pre-heat the oven to 180C/350F/160C fan/Gas 4. Gently melt the butter in a large pan, cool for 5 minutes, then stir in the eggs, flour and cocoa and beat well. Spoon into tin, level the surface and bake for 35 minutes or until a skewer inserted into the centre of the cake comes out clean. To make the rocky road: Gently melt the butter, chocolate and syrup together. Cool for 15 minutes, then stir in the marshmallows, Maltesers, raisins and walnuts. 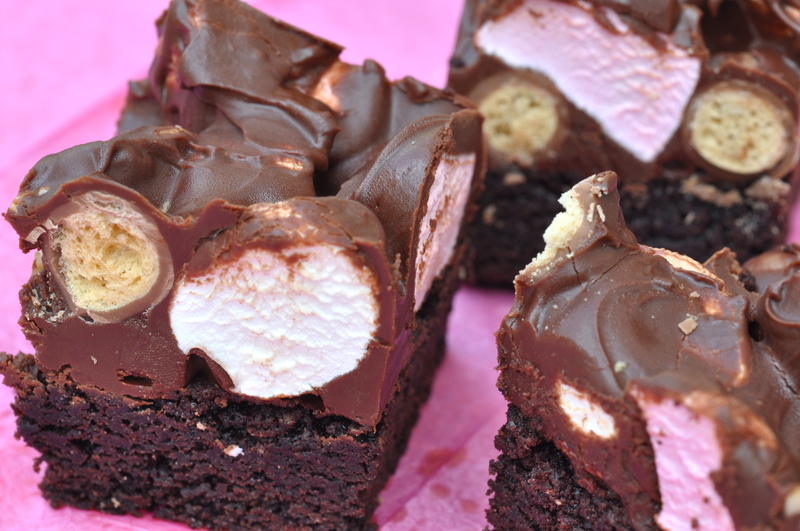 Make sure the chocolate is cool because if it isn’t the marshmallows will melt. Spoon on top of cake in tin and lightly spread to cover it completely. Leave to set in a cool place. Remove from tin, carefully strip off the lining paper and cut into squares. Enter your email address to follow this blog and receive notifications of new delicious posts by email. Unauthorized use and duplication of images, recipes and written material without express and written permission from this blog’s author and owner is strictly prohibited. Excerpts and links may be used, provided that full and clear credit is given to Moya @ Food and Tools with appropriate and specific direction to the original content.